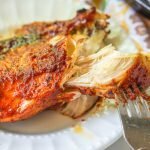 This low carb bbq chicken is so easy to make in the slow cooker. I've also got a delicious low carb bbq sauce you can use to baste and dip your chicken in. You can make this all year long! Liberally season your chicken with salt and pepper on both sides. Add to the slow cooker and cook on high for 3-4 hours or on low until the chicken is tender but not falling apart. While the chicken is cooking, place all the bbq sauce ingredients in a small pan and whisk to combine. Simmer for 10 minutes and take off the stove. Line a cookie sheet with foil and then spray with cooking spray. Place chicken on cookie sheet and baste both sides with the bbq sauce. Place under the broiler for 5 minutes, then flip and broil for 5 minutes more. Serve with extra bbq sauce on the side to dip in if you wish.